Made only for one year, the Alan was shown in the 1946 catalog but may have been introduced in 1942 - only to be interrupted by WWII. 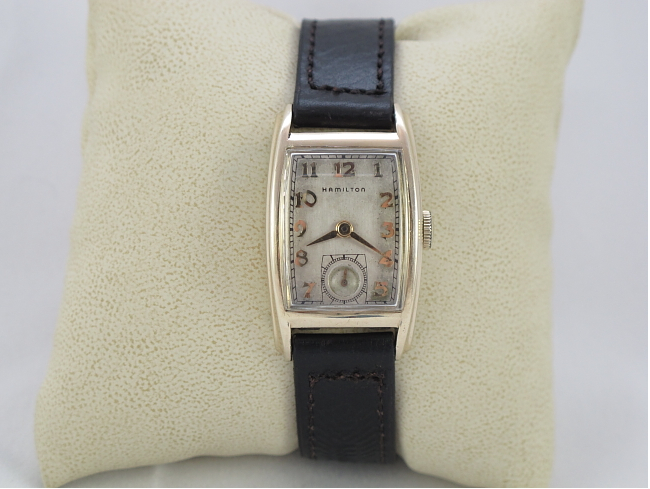 It's very similar to other period watches, especially the Dennis, which was introduced the following year. 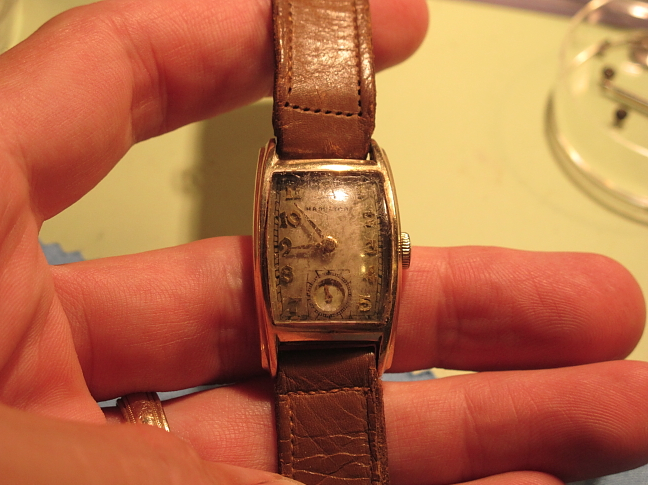 Several watches from this era used the standard equivalent of a 14mm strap (9/16"). 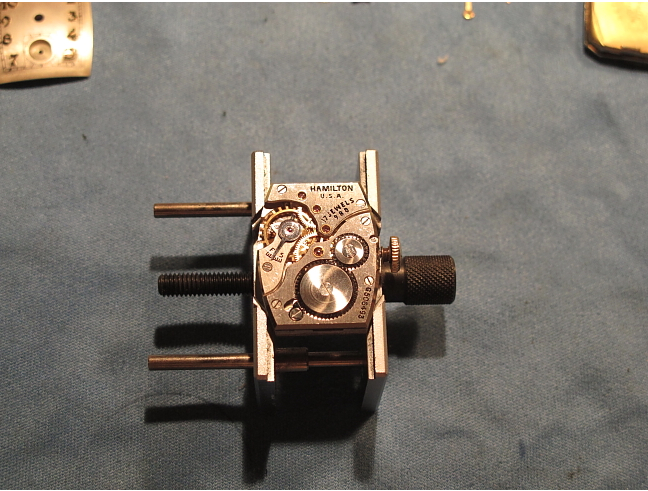 So this is part of a family of long, narrow watches that utilizes the 14/0 sized 17 jewel 980 movement. 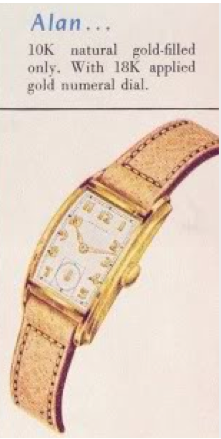 The case is 10K gold filled with a sterling silver dial along with solid 18K gold numerals. I recently picked up an Alan as a project watch. 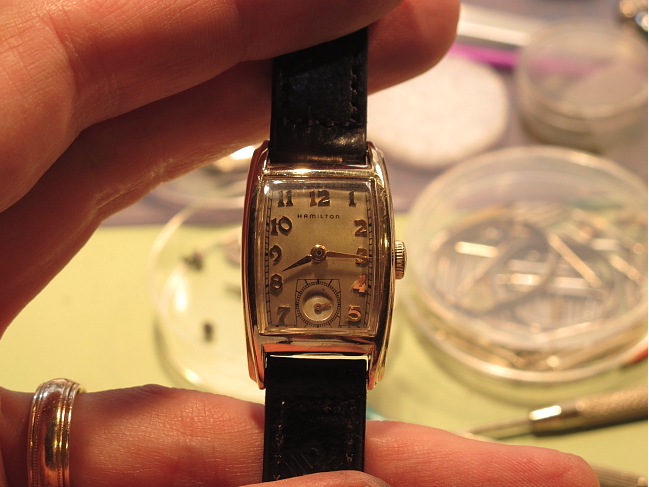 Here's a great example of what an overhaul can do for an old watch. 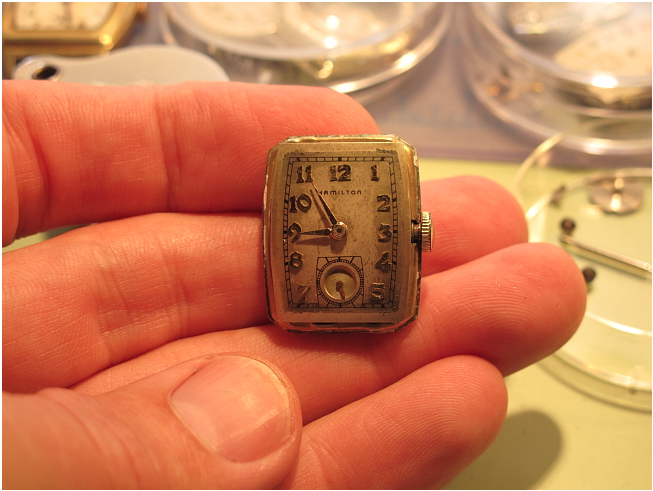 As you can clearly see, this original dial show's it's age - it is almost 70 years old after all. I can probably give it a decent cleanup, it's a little too dirty to leave it as is. The movement is surprisingly clean, just a little dusty. But any dust at all is not a good environment for the internal parts over the long term. 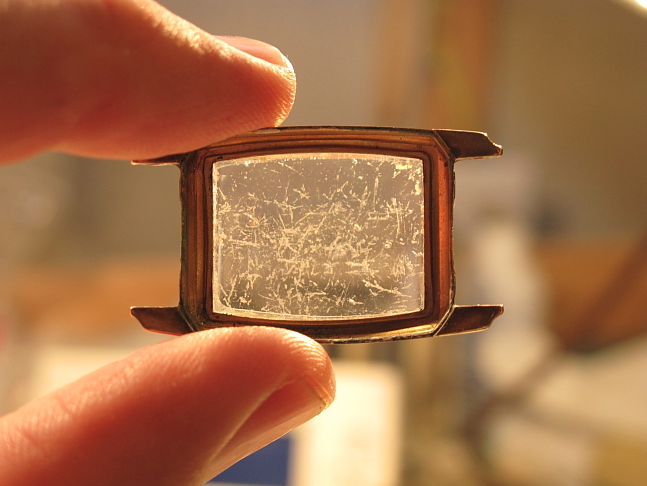 I'd say this one is in need of a new crystal. Don't you think? 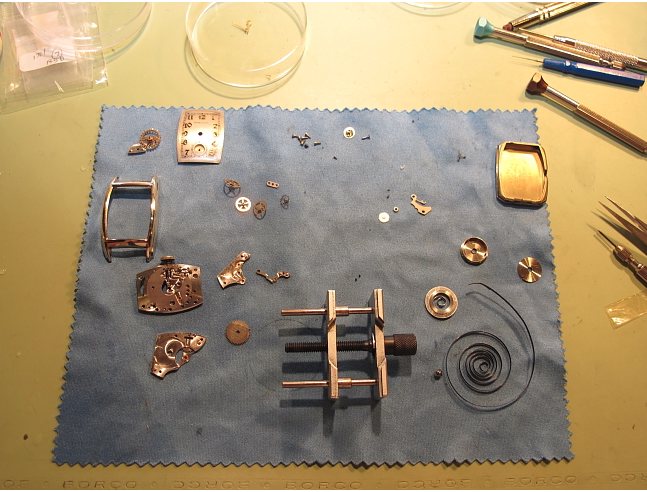 I'll spare you the blow-by-blow disassembly but here's all the parts now cleaned up and drying. 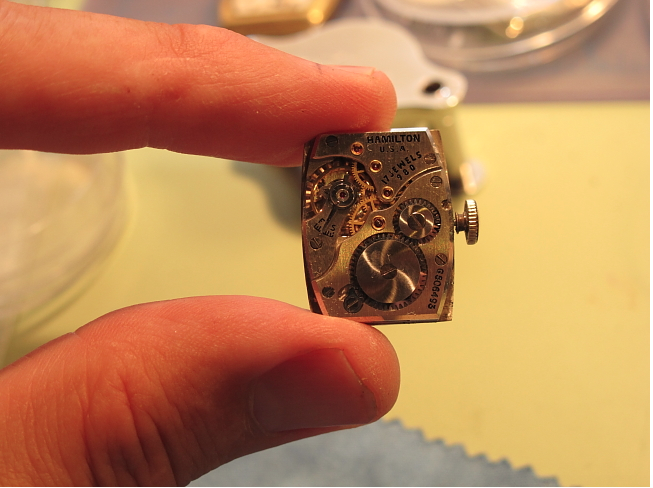 Note how the mainspring (lower right) is pretty much set. It should splay out and coil the other way. I'll put the fresh one just above it into the mainspring barrel on the middle of the right side. This watch will have 40 or so hours of run life. Here's the movement, all put back together and running strong. 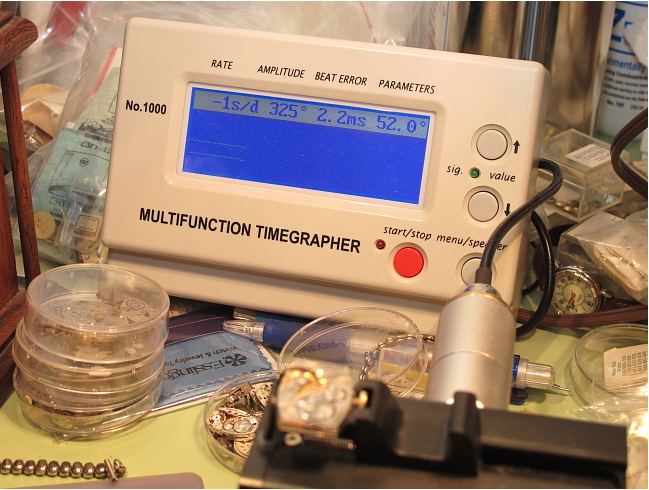 According to the timer its running pretty much dead on after a little tweaking of the regulator. With a new crystal installed, I put the works back into the case and installed a period-correct Hamilton pigskin strap. The lighting in my shop isn't as good as in my photo booth. So here's the grand "ta-da!" shot. I already have a very nice Alan, so this one is headed to the "for sale" drawer to hopefully go to a new home.